The Captain of the ACES HIGH, Teddy McCaffrey. Teddy has been fishing his whole life! He started out with his Dad, Ed, when he was old enough to stand up on Deck, and worked his way "OFFSHORE", working for years crewing and captaining with Captain Tim on both the MONITOR and the COURTNEY ELIZABETH. He then bought and refurbished the ACES HIGH for himself. Capt. 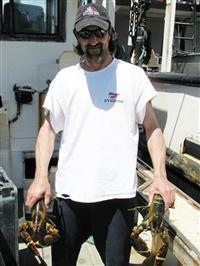 Tim says: "He is one of the finest young skippers to come along in a long, long time and boy, can he catch lobsters!" 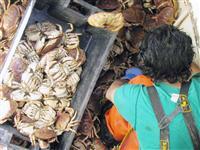 Let's take a peek in the hold and see what she's brought us.... ..rock crab! and a Trip of lobsters, too! 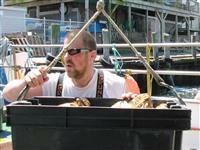 Unloading (or "taking out") boats requires time and labor! Here's Julian, one of the deckhands, rounding up crabs and lobsters to be sent in to be sorted and graded for size and quality. Fishing is all in the family in Point Judith. This is Captain Teddy with his brother, Captain Billy McCaffrey of the "Wendy Lee". They both broke in with their Dad, Ed McCaffrey.